38mm black ceramic case, black ceramic bezel set with 126 diamonds, black dial, quartz movement, black rubber strap with deployant buckle. Water resistant to 100 meters. The Hublot Swiss Watch Company was founded in 1976 in Switzerland by Carlo Crocco from Italy and he named the brand after the French word for “porthole”. His watch featured the first natural rubber strap in the history of watchmaking and took 3 years of research to create the band. 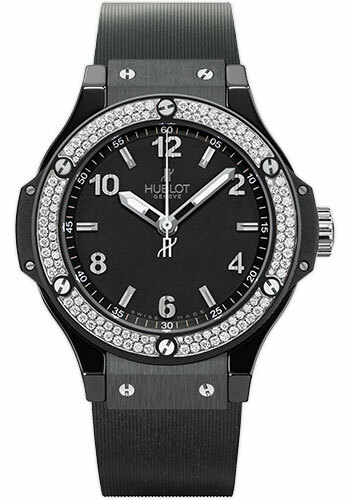 In 2005 the Hublot Big Bang chronograph wristwatch was released and became a huge hit. In 2009 in a revolutionary move to insure authenticity Hublot released the WISeKey smart warranty card and the system authenticates both Men’s and Ladies watches on Hublot's servers. For 2015 and 2016 Hublot styles include the Big Bang in 38, 41, 44 & 45MM sizes and well as Classic Fusion, King Power, Tutti Frutti, Pop Art, Unico, Maradona, Oceanographic, Black Magic, GMT, Kobe Bryant Black Mamba, Dwayne Wade, Ice Bang, Ferrari, and ForbiddenX. Material in these timepieces are of a wide variety: ceramic, stainless steel, rose yellow and king gold, titanium, zirconium, palladium, diamond, and sapphires. SwissLuxury.Com sells authentic Hulbot watches at a great discount sale price and appreciate the modern clean lines and super comfortable rubber straps that this iconic brand produces.